New markets have powered the greatest business successes in history, from Standard Oil to Facebook. How can you discover and pursue new markets to make your business thrive? 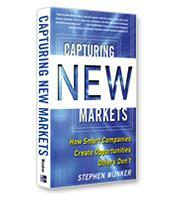 In Capturing New Markets, renowned business strategist Stephen Wunker argues that the first step is to stop applying traditional formulas of success and understand the unique dynamics in fast-changing new markets. He guides you through the process of creating counterintuitive strategies, such as treating competitors as collaborators, timing market entry, and targeting narrow niches before big customer segments.